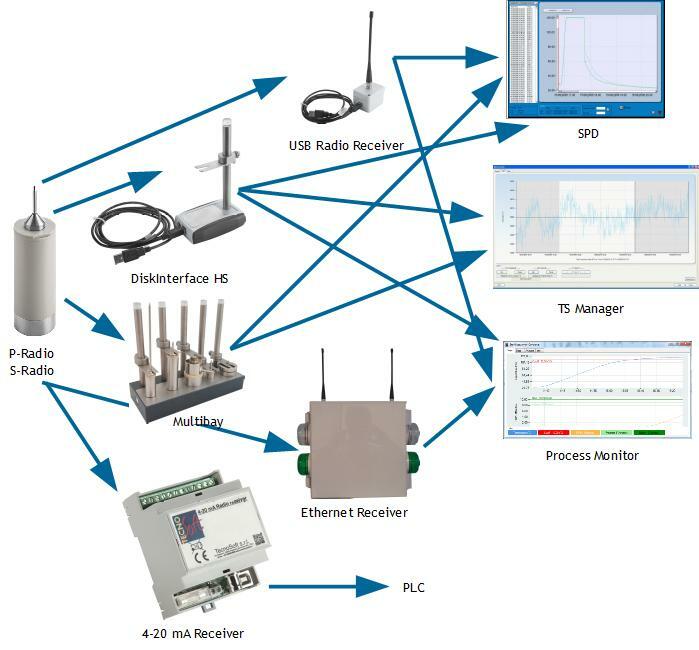 Wireless temperature data logger up to 140°C with probe of various lenghts. Reports are compliant with health regulations and ISO. S-Radio is a wireless temperature data logger from -40°C to 140°C (calibration from 25°C to 140°C) with 20 or 50 or 100 or 150 mm or on demand length external probe (probes cannot be switched) on a 13 mm cone base (base height is not counted for probe length), managed with Windows software and USB interface. Battery is user replaceable and the data logger is provided with an Accredia (NIST equivalent) traceable certificate on 4 points. Thanks to S-Radio process data can be viewed in real time on PC screen along with progressive lethality (pasteurisation units, F0, A0 etc.) values. Alarms can be set on temperature and lethality value itself. With P-Radio you can act in real time on the process, knowing the thermal curve at the core of the product. The version for up to 100°C is available too, along with flexible, bendable versions. It is part of a series of data loggers divided in P-Radio (up to 100°C) and S-Radio (up to 140°C). They require an interface for PC connection: DiskInterface HS, Multibay. For real time data the USB Radio Receiver is needed as well. There are also other models of high temperature data loggers, for pressure and humidity too.